Prior to attending Quilt Con 2015, I watched the lectures from 2013 on Craftsy to get a feel for the event. Angela Walter's lecture on modern machine quilting stands out in my memory months later, not because of her awesome quilts (which are breathtaking), but due a simple phrase that changed my perspective on so many things. "Do what works for you." During the Q&A session at the end of her lecture, she repeats the phrase to the point that it because a bit of a joke, eliciting laughter from the crowd. She does answer questions about her thread and batting choices, techniques, etc. based on her personal preference and experience, but she concludes with, "Do what works for you." I have a bit of a learned type A personality. I think being raised my former-accountant-turned-stay-at-home dad explains that. For the longest time, I was trained to see things as correct or incorrect. At the very least, there would always be a "best" answer that was twice as good as the next option. When I started quilting, I spent countless hours pouring over books, blogs, magazines, and video tutorials trying to find the "correct" answer to every question. Which batting is best? Do you have to match the thread and batting type? What kind of needle should I use for quilt piecing vs quilting? The more people I talked to, the more I realized that everyone's opinions on these matters differed. Some are like my dad and insist there is one correct (or best) way to do things and any other approach is bad juju. For example, I frequently use flat sheets from Target as inexpensive backings. They only cost $10-15, require no piecing, and are snuggly soft. When I mentioned this to one particular quilter, she replied in a steely voice, "You should be shot." Whoa, lady. Sheets work fine for me! I was curious if that woman knew something I didn't, so I did a little research on some quilting forum discussions on the topic. Some posters wrote that sheets should never be used for quilts because the thread count is too high and difficult for the needle to pierce. Meanwhile, there were lots of posts from quilters who reported using sheets without issue. I haven't experienced a single problem using sheets, so hey, it works for me. Haters gonna hate. 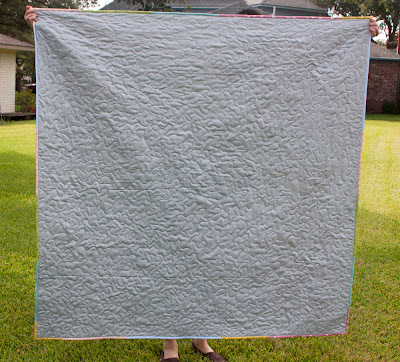 What are some "incorrect" quilting techniques and tips that work for you? "you should be shot"??!! SO MEAN. Even if you think it's wrong sometimes it's nice to just move on and say nothing. I, too, have used a sheet here or there. It's the one place I'm totally fine with a bargain!! I've started using the same sheets. They are amazingly soft and make super cozy quilts! What was the first thing I just did?! Googled target flat sheets! I'm going to give it a try! I would definitely use one from a thrift shop too, if I found a nice enough one. For me, sewing is a hobby and I can't afford top notch fabric for every single portion of my quilt. Ahh, you got yelled at by the Quilt Police!! hahaha! I occasionally use sheets for backings as well. But on the request of my longarmer, I do use low thread count sheets when I do it. Mostly I try to use up stash on the back so I can buy more. My seams do not 100% match which some would say I don't know how to sew. I do not prewash ever. Wow! What an extreme reaction! I wholeheartedly agree that you should do whatever works best for! these things are prequel tee so to speak, but it has never been an issue. Sorry for the double comment. I forgot that blogs do not play well with tahooo accoumts. Epic Game of Thrones Quilt: All Done!